The illustrations and text on this page are intended to compliment the TV antenna manufactures directions. Always read and follow the manufactures instructions. The carton contains four individual parts. The main boom is in two parts. The rear boom portion with the longer elements attached. The front boom portion with the shorter elements attached. The second boom has no elements attached. The small black snap on cartridge board found in a plastic bag attached to the antenna. A. On the back boom (on the right in picture) locate the black rectangular cartridge housing receptacle. It will be located on the main boom with 4 small aluminum rods inside. Face the cartridge receptacle down. B. Remove the nut and bolt at the tapered end of the front boom. With the black element supports facing up on the front boom (on the left in picture) and the cartridge housing receptacle facing down on the back boom slide the two boom pieces together until the holes line up. Insert the bolt and nut and tighten. A. 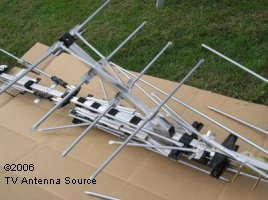 Attached to the main boom are two short reflector booms one on the bottom and one on the top of the TV antenna. Gently fold out the elements on the top reflector boom Fig. 1 Making sure the elements connected to the main boom are out of the way lift the reflector boom up until it snaps into place. Shown in Fig. 2 at right. 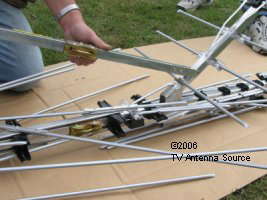 B. Flip the TV antenna over and repeat step A on the second reflector boom. A. Remove the cartridge housing from the plastic bag. Locate the cartridge housing receptacle on the antenna main boom. Align the snaps on the housing with the snap holes on the receptacle. Push the housing into the receptacle until it snaps into place. 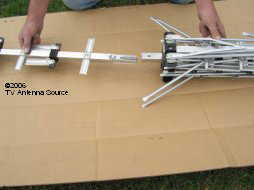 Be sure the aluminum rods (wire) that enter the cartridge are not touching the boom. A. Remove the nuts and bolts on both ends of the second boom. 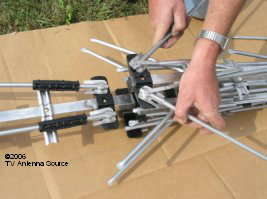 Before proceeding to the next step be sure all antenna elements are folded out far enough and are on the right side of the boom before installing the second boom. If any elements are not in the correct position after the second boom is installed the second boom will need to be removed to correct the problem. Note:Two longer elements are package intentionally on the wrong side of the boom to reduce damage during shipment. These elements are tagged with instructions. GENTLY raise and turn these elements in the direction of the arrows displayed on the white tags. If the TV antenna will be installed in a position on the roof that can be easily reached, you may want to wait to fold the elements out into place until after the antenna is installed. 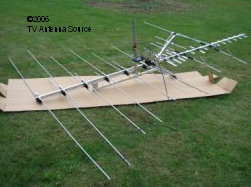 If the antenna will be inaccessible after it is installed fold the elements into place on the ground. 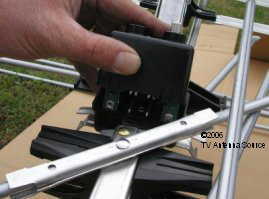 Follow this procedure if you are replacing your current TV antenna and or the mounting pipe is already installed. A. Loosen both u-bolts on the antenna main boom and second boom. B. With the cartridge housing facing down, slip the u-bolts onto the mounting pipe to the desired location and tighten. If you haven't completely folded the antenna elements out at this point, make sure they are out far enough so the mast pipe will not restrict them from folding out after the antenna is installed.. Follow this procedure if you are installing a new mast pipe. A. 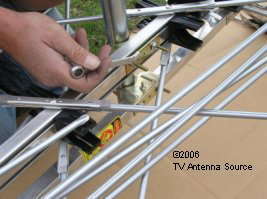 Loosen the u-bolts on the antenna main boom and second boom. If you haven't completely folded the antenna elements out at this point, make sure they are out far enough so the mast pipe will not restrict them from folding out after the antenna is installed. You are ready to carefully install the TV antenna on your mount.